Bladder cancer has numerous genomic features that are potentially actionable by targeted agents. Nevertheless, both pre-clinical and clinical research using molecular targeted agents have been very limited in bladder cancer. We created the Genomics of Drug Sensitivity in Bladder Cancer (GDBC) database, an integrated database (DB) to facilitate the genomic understanding of bladder cancer in relation to drug sensitivity, in order to promote potential therapeutic applications of targeted agents in bladder cancer treatment. The GDBC database contains two separate datasets: 1) in-house drug sensitivity data, in which 13 targeted agents were tested against 10 bladder cancer cell lines; 2) data extracted and integrated from public databases, including the Cancer Therapeutics Research Portal, Cancer Cell Line Encyclopedia, Genomics of Drug Sensitivity in Cancer, Kyoto Encyclopedia of Genes and Genomes, and the Cancer Gene Census databases, as well as bladder cancer genomics data and synthetic lethality/synthetic dosage lethality connections. GDBC is an integrated DB of genomics and drug sensitivity data with a specific focus on bladder cancer. With a user-friendly web-interface, GDBC helps users generate genomics-based hypotheses that can be tested experimentally using drugs and cell lines included in GDBC. Bladder cancer is the sixth most commonly diagnosed malignancy in men . Non-muscle invasive bladder cancer is associated with a good prognosis, whereas muscle-invasive or metastatic bladder cancer has a poor prognosis . For metastatic bladder cancer, cisplatin-based cytotoxic chemotherapy is used as the standard first-line treatment . If this fails, there is no globally accepted second-line treatment option. Recently, Bellmunt and colleagues  demonstrated the superior clinical performance of pembrolizumab, an immune checkpoint inhibitor, establishing pembrolizumab as the standard second-line treatment for metastatic bladder cancer. After large-scale cancer genomics studies, scientists have developed a multitude of targeted agents based on key newly identified genomic aberrations . This approach has been very successful in cancers such as melanoma, non-small cell lung cancer, and breast cancer . Recent genomic studies regarding bladder cancer have demonstrated that this malignancy has numerous genomic features that are potentially actionable using targeted agents [7–9]. In fact, 56–69% of genomic aberrations in bladder cancer are associated with potentially actionable signaling pathways, such as PI3K/AKT/mTOR, RTK/MAPK, and G1-S cell cycle progression. With the exception of a small number of clinical trials, however, targeted agents have not been widely used to treat bladder cancer. In this study, we created the Genomics of Drug Sensitivity in Bladder Cancer (GDBC) database, an integrated database to facilitate the genomic understanding of bladder cancer in relation to drug sensitivity, and thus to promote potential therapeutic applications of targeted agents to bladder cancer (http://gdbc.ewostech.net). GDBC contains two separate datasets: 1) in-house drug sensitivity data; and 2) data extracted from public databases of 27 bladder cancer cell lines (Table 1). As for the in-house data generation, we performed drug sensitivity tests using 13 targeted agents against 10 bladder cancer cell lines (Table 2). For public data, we extracted and integrated publicly available data on 27 bladder cancer cell lines from the following data portals: 1) Cancer Therapeutics Research Portal (CTRP) ; 2) Cancer Cell Line Encyclopedia (CCLE) ; 3) Genomics of Drug Sensitivity in Cancer (GDSC) ; 4) Kyoto Encyclopedia of Genes and Genomes (KEGG) ; 5) Cancer Gene Census (CGC) ; 6) bladder cancer genomics data ; and 7) synthetic lethality (SL)/synthetic dosage lethality (SDL) connections . Figure 1 illustrates how GDBC was constructed; Table 1 summarizes the pharmacogenomic landscape of 27 bladder cancer cell lines. We performed drug sensitivity experiments using 13 targeted agents against 10 bladder cancer cell lines (Table 2). These 13 targeted agents were selected based on the potential actionable genomic aberrations identified through bladder cancer genomic analyses [7–9]. All cells were maintained as per the recommendations of the ATCC or other references. Briefly, 1 day before the treatment, cells were plated at a density of 3–5 × 103 cells/well in 80 μL of culture media within a 96-well plate. After overnight incubation, cells were treated with each drug at the indicated concentration in 20 mL of culture medium. To calculate the IC50 of the test drug, cells were treated with 10 serially diluted concentrations of drugs (25% serial dilution) from a highest concentration of 10 μM (10 μM, 2.5 μM, 0.625 μM, 0.015625 μM, 0.0039 μM, 0.000975 μM, 0.00024375 μM, 0.0000609 μM, 0.0000152 μM, 0.0000038 μM), and after 48 h of incubation, cellular adenine-triphosphate (ATP) content was evaluated using the CellTiterGlo assay (Promega). Every dilution step was performed to maintain same concentration of DMSO. The raw ATP values were recorded and transferred to Prism software. Raw values from non-treated control (non-treated control implies DMSO treated with same percentage in culture media) wells were adjusted to 100% of survival, and the relative survival rates were calculated by dividing the ATP luminescence values of the test well by those of the control wells. IC50 values of each drug in different cells were calculated by performing non-linear regression analysis. Data represent the mean values of calculated IC50 from two independent experiments. Raw datasets from CTRP , CCLE  and GDSC  were downloaded. Previously published mutation data from the literature were extracted and added to the CCLE and GDSC data to enhance the information . The cancer gene census (CGC) genes are also stored in a database through which cancer researchers can easily identify hotspot genes. SL/SDL connections were taken from Jerby-Arnon et al. and the p-value of each connection was recalculated using only bladder cancer cell lines . The method of p-value calculation is available on a website (http://gdbc.ewostech.net/Documentation.php); we modified the original algorithm because of data limitations. Finally, we stored all this information in a database for easy access. Furthermore, information was downloaded from KEGG and stored in a database that helps the user to identify the importance of a particular gene by looking at its pathways. The normalized CNV values were downloaded from CCLE website and stored in a database . We considered values greater than 1 to be amplifications and lower than 1 to be deletions. Amplifications are shown in red and deletions are shown in blue. Our method is based on Jerby-Arnon’s method that was used for the CCLE database . In cancer genomic studies, differential expression analysis is usually performed by comparing the gene expression values of tumor samples with those of matched normal samples. In the case of cell lines (e.g., as in CCLE), however, there are no normal counterparts to be compared. Jerby-Arnon et al. used percentile based method to detect up-regulation and down-regulation in CCLE cell lines. In this study we scored up-regulation and down-regulation based on the following two conditions: 1) The values should differ at least by 15% from the mean of all other available cell lines in CCLE irrespective of cancer type; 2) We calculated the percentiles using all cell lines in CCLE and it should be the top 10 percentile of genes in CCLE were classed as up-regulated and the bottom 10 percentile as down-regulated. The calculated expression shows the difference of expression from the average of the remaining cell lines; 100% is exactly the same as the average. Up-regulations are shown in red and down-regulations are shown in blue. Drug sensitivity for GDSC and CCLE is decided on the basis of the IC50 value: if the IC50 value is below 1 the block will be in red, showing high sensitivity, but users can freely decide sensitivity by comparing the IC50 values of that drug in other cell lines. GDSC has one of the largest drug sensitivity datasets across cancer cell lines. We extracted bladder cancer drug-related data from GDSC, which are comprised of data obtained from 224 different drugs tested against different bladder cancer cell lines. The average IC50 is the average sensitivity of those drugs in different available cell lines across whole database. Sensitive cell lines are shown in red. The graph shows the IC50 values of different drugs in comparison with the average IC50 and other selected cell lines. Furthermore, CCLE contains a dataset of 24 clinically relevant drugs and data of 13 clinically relevant drugs that was tested in-house against 10 cell lines. For CTRP, ~ 475 compounds were tested against bladder cancer cell lines and the subsequently generated area under curve (AUC) from all these lines is available to download. The AUC values are converted using the R extreme values software package and outliers are considered as sensitive or resistant. All these datasets are part of GDBC. Synthetic lethality (SL) is when one gene is inactive and another gene is essential for cell survival. On the other hand, synthetic dosage lethality (SDL) is when one gene is over-active and another gene is essential for cell survival. The SL and SDL algorithm was adapted from Jerby-Arnon et al. with some modifications because of data limitations . We removed the shRNA aspect from the algorithm; complete details of the algorithm and the parameters of the calculations are available on the website under the documentation section. All data are stored in a MySQL database (v. 5.5.47) after processing. All mutations, CNV and expression data are converted into tabular form for storage in the database. The website was developed in PHP5 and deployed on an Apache2 server. GDBC contains pharmacogenomic data of 27 bladder cancer cell lines. Table 1 summarizes the data included in GDBC for each of the 27 bladder cancer cell lines. For example, bladder cancer cell line 5637 has 1400 mutations, 117 gene deletions, 85 gene amplifications, 1123 gene up-regulations and 1404 gene down-regulations. In addition to the genomic information, GDBC provides drug response data for the 5637 cell lines against 463 compounds from CTRP, 217 compounds from GDSC, 24 compounds from CCLE, and 10 compounds tested in-house. It has been questioned whether cancer cell lines are true representatives of real cancers. We performed a systematic comparison of genomic profiles from bladder cancer tissues  and those of bladder cancer cell lines present in GDBC. First, at the gene expression level, bladder cancer cell lines showed gene expression patterns that were similar to those of bladder cancer tissues. For example, APOBEC3B, EGFR, KRT14, KRT5, KRT6A and AKT3 were up-regulated in both datasets. Second, at the DNA level, bladder cancer cell lines harbored the majority of functionally important CNVs and mutations identified in bladder cancer tissues. For example, frequent deletions in CDKN2A, PDE4D, RB1, FHIT, FAM190A, LRP1B, and WWOX and amplifications in E2F3, CCND1, PPARG, and EGFR were observed in both datasets. Furthermore, TP53, FGFR3, PIK3CA, TSC1, RB1, KDM6A, CREBBP, EP300, and ARID1A were frequently mutated in both datasets . In summary, bladder cancer cell lines had many of the potentially actionable genomic features identified in bladder cancer tissues and thus appear to be suitable for pharmacogenomic studies (Additional file 1: Figure S1) . When developing GDBC, we assumed that the main users of GDBC would be cancer biologists and clinicians involved in bladder cancer research. Using the web interface, researchers can extract meaningful information from GDBC in multiple ways by using simple keywords as search terms. Two use case scenarios of GDBC are described below. The fibroblast growth factor/fibroblast growth factor receptor (FGF/FGFR) is a receptor tyrosine kinase (RTK) signaling pathway that plays important roles in diverse cell functions, including proliferation, differentiation, apoptosis and migration . The dysregulation of FGFR1 and FGFR3 is common in bladder cancer. Additionally, FGFR inhibitors are under clinical investigation in other cancer types. For example, AZD4547, a selective FGFR (FGFR 1–3) inhibitor, inhibited cell proliferation in both cancer cell lines and tumor xenograft models, in which the FGFR pathway was activated . PD173074, a pan-FGFR inhibitor, blocked the growth of small cell lung cancer (SCLC) both in vitro and in vivo . Based on these backgrounds, we questioned whether there would be any pharmacogenomic relationship between FGFR1/FGFR3 dysregulation and FGFR inhibitors in bladder cancer. To address this question, we first performed a gene-centric search; we simply typed FGFR1 and FGFR3 into the gene search box to search for these genomic features in GDBC. According to the gene search results of GDBC, FGFR1 and FGFR3 were up-regulated in ~ 15% and ~ 20% bladder cancer cell lines, respectively. In addition, FGFR3 was non-synonymously mutated in ~ 11% of bladder cancer cell lines. The gene-centric search result also provided information on three drugs (namely, AZD4547, PD-173074 and nintedanib) that target both FGFR1 and FGFR3. Then, we performed a drug-centric search using the drug information acquired from the gene-centric search. According to the drug search results, AZD4547 was tested in 23 bladder cancer cell lines; three cell lines (RT112, JMSU1, and UMUC1) were sensitive to AZD4547. PD-173074 was tested in 16 bladder cancer cell lines; RT112 was remarkably sensitive to PD-173074, whereas RT4, SW780, and 639 V showed a partial response to PD-173074. Nintedanib was tested in 20 bladder cancer cell lines; 639 V and KMBC2 showed only a slight response to Nintedanib. In RT112, which was responsive to both AZD4547 and PD-173074, FGFR3 was substantially up-regulated. In JMSU1 and UMUC1, which were both responsive to AZD4547, FGFR1 and FGFR3 were each up-regulated, respectively. Altogether, these findings suggest that it is worth experimentally testing the pharmacogenomic relationship between the dysregulation of FGFR1 and FGFR3 and FGFR1/FGFR3 inhibitors in bladder cancer. The epidermal growth factor receptor (EGFR) is a key factor in epithelial malignancies, and its activity enhances tumor growth, invasion, and metastasis . EGFR is highly expressed in several cancers, and is a critical factor in driving tumorigenesis. Various drugs targeting EGFR (i.e., erlotinib, lapatinib, gefitinib, afatinib, etc.) have been approved for the treatment of several cancers . EGFR is up-regulated in ~ 19% of bladder cancer cases , being a potentially actionable target for therapeutic manipulation in bladder cancer. Based on this background, we questioned whether there would be any pharmacogenomic relationship between EGFR up-regulation and drugs targeting ERBB family members in bladder cancer. To answer this question, we first performed a gene-centric search by typing EGFR into the gene search box. This simple search revealed that EGFR was significantly up-regulated in ~ 18% of bladder cancer cell lines and that a number of EGFR-targeting drugs (i.e., gefitinib, WZ4002, afatinib, PD 153035, lapatinib, erlotinib, canertinib, neratinib, vandetanib, WZ8040, Pazopanib, Axitinib, AMG-706, BIBW2992, ZD-6474, and Caborazantinib) were tested in bladder cancer cell lines. Then we performed a drug-centric search using the drug information acquired from the gene-centric search. According to our drug search results, bladder cancer cell lines with relatively high expression of EGFR were more sensitive to EGFR-targeting agents (Fig. 2). Bladder cancer cell lines with high expression of EGFR, including SCABER, 5637 and UBLC1, were markedly sensitive to EGFR-targeting agents. Altogether, these findings suggest that it is worth experimentally testing the pharmacogenomic relationship between the EGFR up-regulation and EGFR-targeting agents in bladder cancer. This study was motivated by two key factors: 1) despite numerous genomic features that are potentially actionable by targeted agents, both pre-clinical and clinical studies using molecular targeted agents have been very limited in bladder cancer; 2) public databases have their own strengths and weaknesses in terms of genomics and drug sensitivity data. Furthermore, drug sensitivity data for bladder cancer cell lines are very limited. In this study, we have created GDBC, an integrated database to facilitate the genomic understanding of bladder cancer in relation to drug sensitivity, and thus to promote the potential therapeutic applications of targeted agents to bladder cancer. GDBC includes data not only from public databases such as CTRP, CCLE, and GDSC, but also from in-house experiments specifically targeted against bladder cancer. CTRP, CCLE, and GDSC are three major pharmacogenomics DBs with different strengths and weaknesses; CCLE has genomic information with very limited drug information; GDSC has drug information with very limited genomic information; and CTRP has other limitations because of a very stringent interface (i.e., one cannot query against a particular cell line or tissue of origin). Our main goal for this study was to combine all bladder cancer-related public and in-house data in one platform with a user-friendly interface. Implementation of precision cancer medicine requires in vitro and in vivo proof-of-concept studies followed by clinical trials. GDBC is a powerful tool in that researchers can easily identify potential pharmacogenomic relationships in bladder cancer. Based on the hypotheses generated by GDBC interrogation, researchers can perform further in vitro and in vivo validation and, eventually, clinical studies. As mentioned above, GDBC contains both in-house and public data. One of the typical drawbacks in integrating different data sources is the potential inconsistency of the data. These types of inconsistencies may result from a number of biological and methodological factors that differ between the data sources. For example, the number of cells seeded per well, the drug concentration range examined, the number of cell doublings achieved, the types of cell viability assay, the analytical tools to calculate drug sensitivity, and so on . In short, this type of inconsistency is one of the inevitable features of data integration. Therefore, when encountering any inconsistency, researchers need to investigate experimental details that may have caused the inconsistency between different data sources and to identify a way to validate pharmacogenomic relationships in their own contexts. In order to provide users with updated information, we have developed a computational pipeline to update the GDBC database. Currently, our plan is to automatically update GDBC every 3 months and manually on any requests. Users can share their data with us in simple tab delimited text files that will be parsed by our pipeline and will be added into the GDBC database. 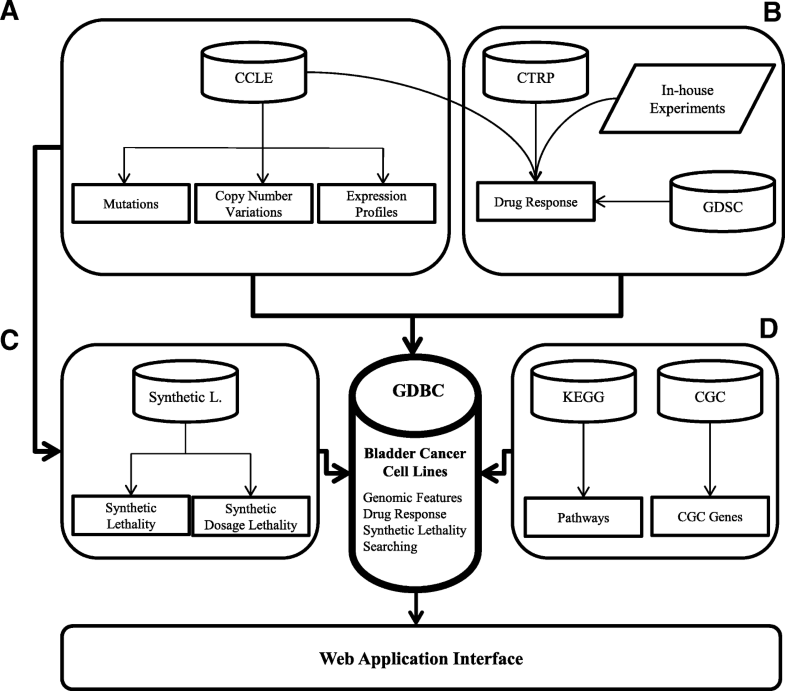 GDBC is an integrated pharmacogenomic database specialized for bladder cancer. GDBC can be used as a tool to facilitate the genomic understanding of bladder cancer in relation to drug sensitivity, and thus to promote potential therapeutic applications of targeted agents to bladder cancer. Adnan Ahmad Ansari and Inkeun Park contributed equally to this work. This study was supported by The Korean Health Technology R&D Projects, funded by the Ministry of Health and Welfare, Republic of Korea and by grants HI14C1931 and HI16C1985. The funders played no part in the design of the study or the collection, analysis and interpretation of the data, or the writing of the manuscript. All datasets generated or used in this study are publicly available and can be downloaded from our website (http://gdbc.ewostech.net/). SMA and JLL conceived and supervised the study; IKK, IKP, and SJP designed and carried out experiments; SMA and AAA drafted the article; AAA conducted bioinformatics analyses; All authors read and approved the final manuscript. CTD2 Data Portal. https://ocg.cancer.gov/programs/ctd2/data-portal. Accessed 17 Jan 2018. 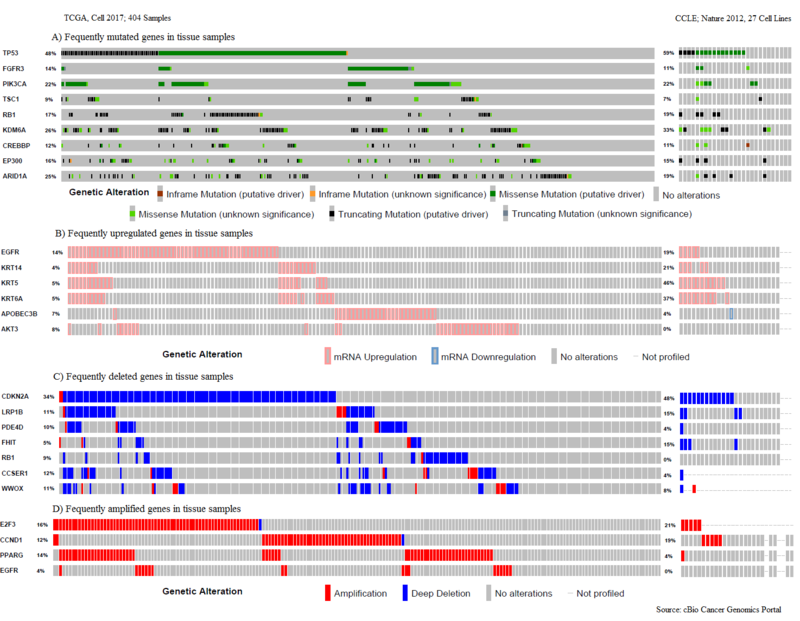 Broad Institute Cancer Cell Line Encyclopedia (CCLE). https://portals.broadinstitute.org/ccle/data. Accessed 17 Jan 2018. 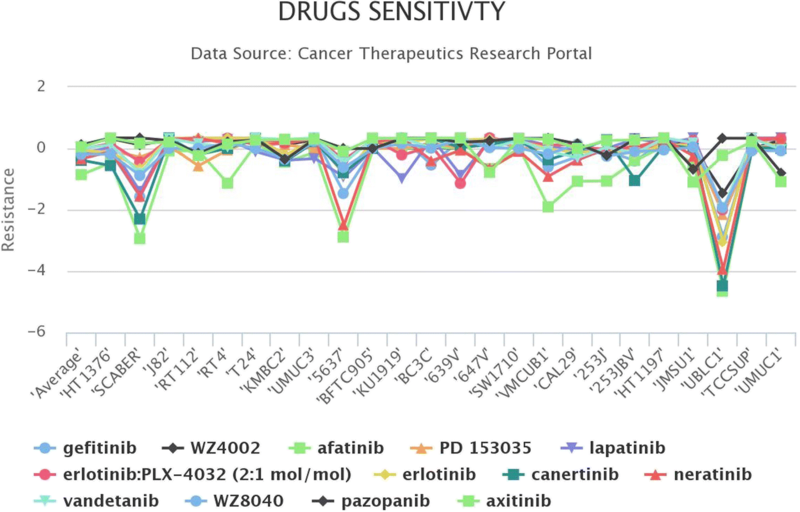 Downloads - Cancerrxgene - Genomics of Drug Sensitivity in Cancer. http://www.cancerrxgene.org/downloads. Accessed 17 Jan 2018.